This photo shows part of a field which is about 3 acres in size in total. The part on the left has been allowed to lie fallow for the past four years – just being cut once per year. It had previously been used to grow cereals, and had been ploughed once or twice a year, and regularly treated with inorganic fertilisers, herbicide, pesticide, and fungicide. As can be seen from the picture, very little is growing apart from a few clumps of grass, ivy and moss. The ground to the left of the picture was used as horse pasture until a year ago; it has been ploughed periodically over the past thirty years, and has been treated with nitrogen fertiliser, but has not been intensively farmed. It has a fairly good covering of grasses, interspersed with dock plants. 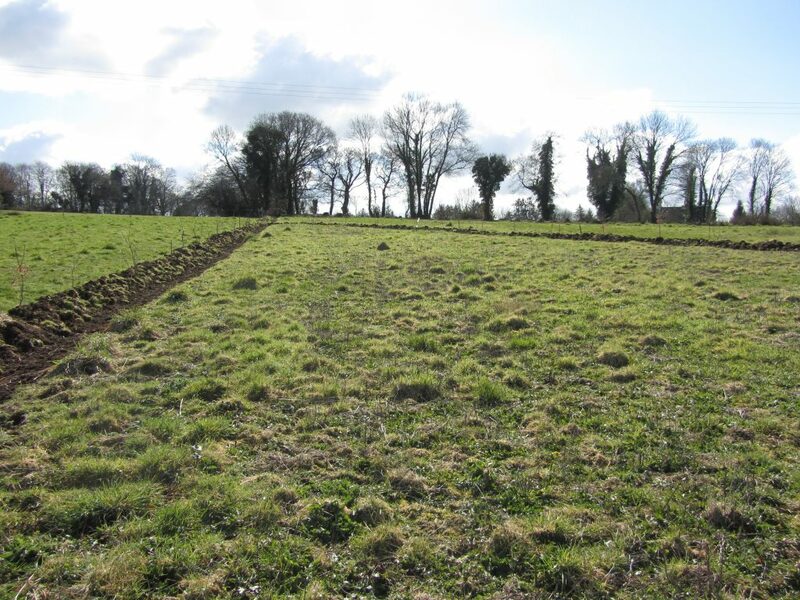 The first step to restoring soil fertility is to divide the field up into smaller sections with banks and trees. Trees find it difficult to become established in compacted post-industrial-agricultural soil; young roots find it difficult to break through the soil, and suffer through lack of air and supportive micro-organisms. Trees planted directly into these types of soil will survive, but it may take five or six years before they start to put on any serious growth. The process can be speeded up by building rudimentary banks: the trees can be planted into the field itself, and earth then piled up around the trees, to create a bank. The tree roots will spread out into the bank, which will be well-aerated, and will host more micro-organisms than the surrounding soil. This will boost the tree growth, and in following winters, more soil can be added to the bank. The bank will slow down the drainage of water from the field, making it easier for the young trees to get the water they need in the drier summer months, and helping to extend their active growing period. In time, the bank will start to develop its own range of flora (wild flowers, fungae, mosses, shrubs) and fauna (insects, tree-nesting birds, frogs, toads, small mammals), which will have a positive impact on the fields themselves. Once they have attained a certain size, the trees on the bank will draw up minerals from the subsoil, and will start the process of regenerating a layer of healthy topsoil in the fields.